The Palladium Plaza is a 5-story, 65-unit condominium building that has an exceptional architectural and interior design. It has granite countertops, stainless steel appliances and stained concrete floors in the living area. 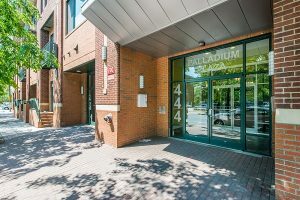 It is located on Blount Street across from Raleigh City Market and only a block away from historic Moore Square and Fayetteville Street where there are many unique restaurants, museums and an exciting nightlife. Due to the popularity and limited inventory of Palladium Plaza, often there are no listings to display. If you do see an available listing, it will likely go fast! Contact Us today for a personal showing. If you are interested in purchasing a unit in Palladium Plaza, ask us about our services for locating properties not yet on the market. We will leave no stone unturned looking for the perfect property for you. If you are considering selling your property in Palladium Plaza, we can help you find a buyer – likely before we list it!